We’re pleased to announce the immediate availability of EverWeb version 2.5 which now supports 64-Bit computing. Apple recently announced that the recent release of macOS High Sierra would be the last OS version to support 32 bit applications ‘without compromise‘. As Apple moves towards being a 64-Bit only environment it is important that applications, such as EverWeb, move as well so they function properly under future releases of macOS. In everyday use, you may notice some performance improvements in EverWeb as well as being able. to create larger EverWeb project files than you could before. When updating to EverWeb version 2.5, the update process will automatically download the correct version of EverWeb for you. 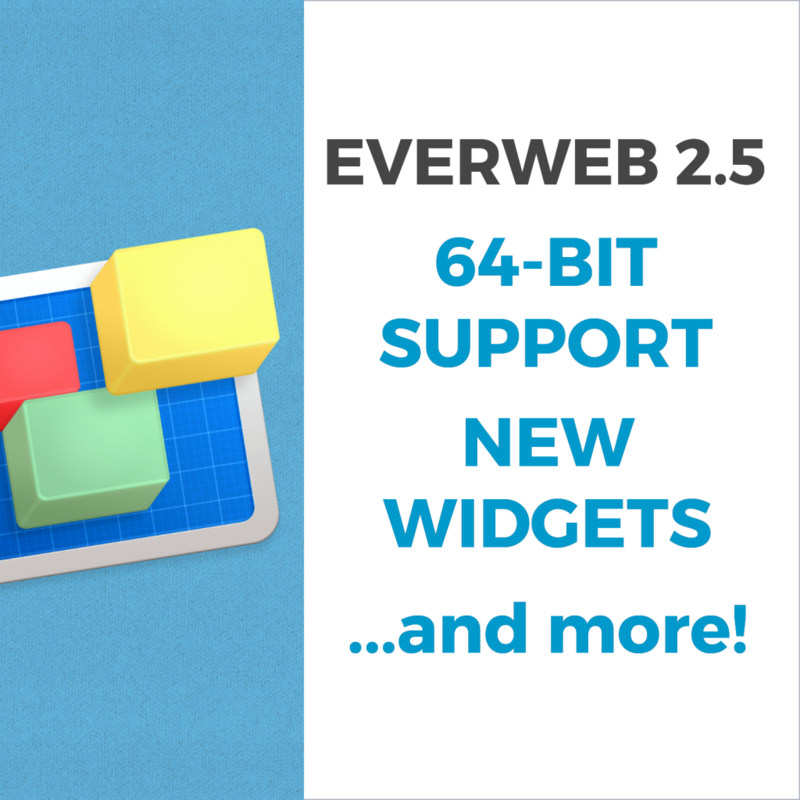 [NEW] EverWeb is now 64-Bit which means it can handle even larger websites and perform faster in almost all aspects. [NEW] Enhanced Preview provides an exact local preview of what you will expect when you publish your website. Widgets that had issues when previewing now preview correctly. [NEW] RSS caching makes RSS feeds work faster and more reliably on all web hosting platforms and work 100% with EverWeb + Hosting. [NEW] Facebook Page Timeline widget. [NEW] Live Photos widget lets you add Live Photos from you iPhone to your website. [NEW] Rename menu in File menu lets you rename your website, blog posts, pages and assets. [FIX] Email messages from the Advanced Contact Form are encoded properly for non-latin based languages so Chinese, Japanese, Russian etc… messages will display properly. EverWeb version 2.5 is free for EverWeb + Hosting users and EverWeb Standalone users who are within their 1 year of free upgrades and support period. Login to your client area and go to the ‘Manage Product’ page. On the left of this page, select ‘Downloads’ and choose the version of Everweb that you need, either the OS X 10.6 version,or OS X 10.7 and later, version. EverWeb Is Compatible With Yosemite! Yesterday marked the official launch of Yosemite, Apple’s latest update to the OS X operating system. 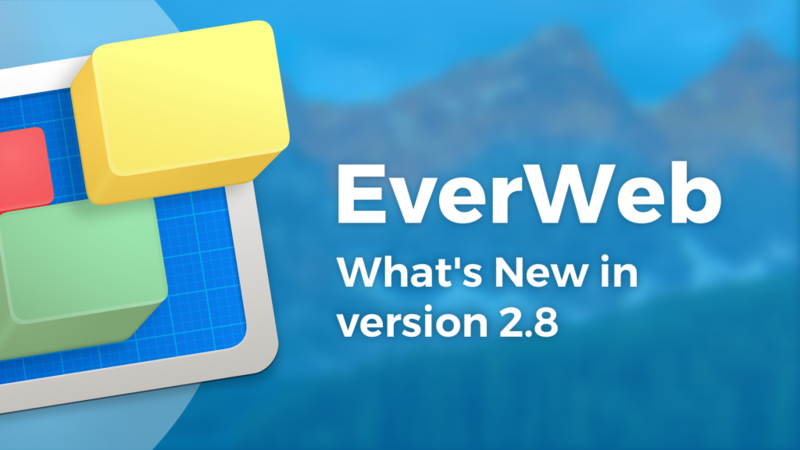 We are proud to announce that EverWeb is compatible with Yosemite, so for those of you wondering if you can install the update and still use EverWeb, the answer is yes! The latest official release of EverWeb is version 1.6 so make sure that is the current version on your computer. Yosemite brings some exciting new changes to your Mac, and that means that EverWeb will bring some new changes as well. The next version of EverWeb (1.7) will be even better and include many changes that gives the app a beautiful Yosemite look. Keep your eye out for a beta version of 1.7 to be released on our forums within the next little while. Many EverWeb users have submitted their EverWeb made sites to be displayed on the EverWeb website. A lot of you have created some amazing websites and we are very impressed. Check them out and see just how incredible an EverWeb site can be! As a reminder, any standalone users wishing to upgrade to an EverWeb + Hosting plan can do so in their account by going to Services > My Services, and clicking on the arrow next to View Details where you will see the Upgrade link. This isn’t a goodbye, but a well deserved Thank You. Thank you for your ideas. Thank you for your inspiration. Thank you for the positive influence you have had on all of us here. Although a minor update, this may indicate that Apple is still working on iWeb and hopefully will release something that we can consider iWeb 11 to go along with the previous iLife updates. iWeb is still not yet available in the Mac App Store. iLife ’11, Including iWeb ’11, Coming Soon? Reports of a new version of iLife have been circulating for a few months now. It was first speculated that iLife ’11 would be released in August, then September and now November with a book listing on Amazon.com according to 9to5mac.com. Whether or not iLife ’11 gets released next month with a new version of iWeb is yet to be known. What we do know is that all of our software will be 100% compatible with the new version of iWeb. The only product that may need an update is iWeb SEO Tool, but it is very unlikely that the new version of iWeb will cause conflicts with it. All of our other software will be fully functional in their current versions when iWeb ’11 is eventually released. Our speculation for what will come with iWeb ’11 is new templates, twitter integration, updated blogging features and possibly some creative HTML 5 only features. 64-bit versions of all applications is also very likely. An iOS version is also very possible. We were extremely pleased to find RAGE Domainer chosen as a Staff Pick on Apple’s Mac OS X download pages. It joins RAGE Google Sitemap Automator and RAGE MapDesign on Apple’s Staff Pick list. Check it out here: Domainer on Apple’s Staff Pick List. The second thing that really surprised me was how many companies were there to promote iPod accessories, specifically iPod cases. There were so many companies promoting all these iPod cases, many promoting virtually the same iPod case, just in a slightly different color. Then you had a wide variety of iPod speakers. These guys must be selling their stuff because Macworld is not cheap. If they are then good for them. However, I think for the good of the Mac platform and the Mac community there needs to be a rise in the number of software (specifically shareware or small software companies), who attend to show off their new Mac products. There are small pavilions that small software companies are able to purchase for a relatively cheap amount, but by far the most prevalent products announced and being promoted at Macworld were iPod related. I would personally like to see Macworld take the initiative to support small software developers by recognizing the impact small developers have on the Mac community. They should guarantee a certain number of small software vendors and reduce the price for ADC pavilions to make them more accessible to emerging Mac developers. Although there were a lot of small software companies exhibiting, in relation to iPod related products, they were well out-shined. Other than that, I think the Macworld Expo was a great success and a great resource for Mac enthusiasts. Even more importantly, next year it will be a great resource for RAGE enthusiasts. We have already booked our booth and will be there to show off some new products we have been working on and, more importantly, meet face to face with our customers. We will post more details as the event gets closer, but we are real excited here for next year. For now, mark down January 14-18, 2008 in your iCal calendar!